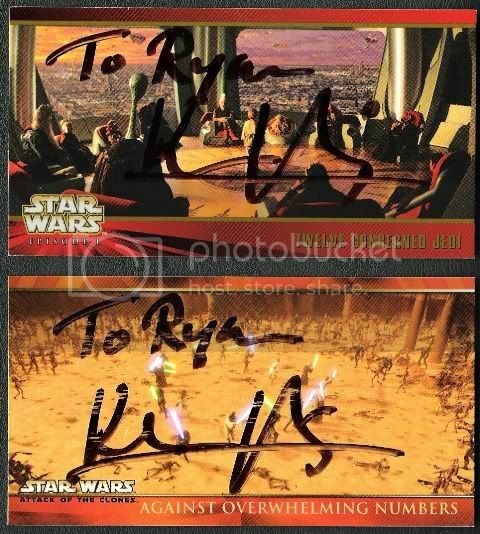 Discussion in 'Autograph Collecting' started by darthskellington, Jan 14, 2007. Mr. Bonfils has a very short known filmography. He has appeared mainly in action roles such as guards and villains. He presumably has a martial arts background. His IMDB filmography consists of 7 films, including Shadow Run, Tomb Raider 2, Sky Captain, Batman Begins, and the upcoming film Body Armour. He appeared in The Phantom Menace as Jedi Master Saesee Tiin. He also appeared in the Council scenes in Attack of the Clones. (For the Geonosis scenes, Jesse Jensen played Saesee Tiin, and yet another actor took on the role in Revenge of the Sith). Both addresses below have had success this past year. Mr. Bonfils seems willing to sign items sent to him. In most cases responses have taken 2-3 months. Should any celebrity wish their address not posted, please contact myself (darthskellington) or any site staff member and it will be removed immediately. My letter went out today using the Paul Telford address! Sent my 2nd letter to Mr. Bonfils today! I included some of my home made 4x6's for him to sign!! Got an RTS from Khan Bonfils. It said: NOT KNOWN AT THIS ADDRESS!!!! on the envelope. So I guess we can scratch this one. Oh Man! Sorry to hear that Hopefully we can find a new one quick!! Well today I got a RTS from Khan Bonfils. I knew it would be coming soon since most of the people that sent a request got their's back RTS. I used the Paul Telford MGMT. address. rts-bummer....I used the Paul Telford MGMT. address. Hey guys! So I was watching BATMAN BEGINS last Sunday and afterwards I was reading the credits and I was surprised to see the name Khan Bonfils listed as a "League of shadows warrior"! Curious as to where his scenes were I backtracked and was able to find him quite easly now that I knew who it was! I included some screen shots for you to see. His cameo is roughly 1-hour & 50 minutes into the film. Very nice!! He's super cool.